Global meat consumption is predicted to double by 2020. Much of this increase will come from China, where the growing middle class is demanding more meat and other animal products. As a result, China is now rushing helter-skelter down the path blazed by giant agribusiness corporations in western nations. Once, the animals we raised went out and gathered things we could not or would not eat. Cows ate grass, chickens pecked at worms or seeds. Then we ate their flesh, or their eggs, or drank their milk, thus adding to the amount of food available to us. Now the animals are brought together in “concentrated animal feeding operations”, or CAFOs. It is not unusual to have a million hens, 100,000 pigs, or 50,000 cattle brought together to be fed in this way – the hens and pigs indoors, in vast sheds, the cattle outdoors, on dirt feedlots that stretch to the horizon. Once the animals are concentrated in this way, they need to be fed, so we grow food for them. We use synthetic fertilizers and oil-powered tractors to grow corn or soybeans. Then we truck it to the animals so they can eat it. And instead of spreading their manure in a natural manner around the fields, it accumulates in vast quantities. It needs to be trucked away, but often, before it is, it pollutes local streams and ground water. All this use of oil contributes significantly to global warming. These CAFOs also have terrible odour problems and attract flies and other vermin. Defenders of these production methods argue that they are a regrettable but necessary response to a growing population’s demand for food. The truth is exactly the reverse. When we confine animals in factory farms, we have to grow food for them.The animals burn up most of that food’s energy just to breathe and keep their bodies warm, so we end up with a small fraction – usually no more than one-third and sometimes as little as one-tenth – of the food value that we feed them. The traditional Chinese diet used meat in very small quantities. Now, with the increased demand, China is importing more and more grain and soybeans in order to feed its factory-farm animals. If it simply wanted to feed its people, they could eat the grains and soybeans directly, as they used to do, and the total amount of grain and soybeans needed would be much less. So too would be the greenhouse gas emissions caused by each mouthful of our food. According to Vaclav Smil’s Feeding the World, producing milk, meat, and eggs based on feeding the animals crops “inevitably” leads to less food than we could produce from the land on which the crops were grown. This holds, Smil writes, whether we are talking about the energy the food provides, or the amount of protein we obtain from it. Hence, Smil calculates, it is simply not possible for everyone in the world to eat as much meat as people in the affluent world now eat, because to produce that amount of meat would, in the absence of some unforeseen advances in bioengineering, require 67 per cent more agricultural land than the world possesses. Ironically, while China copies the western methods of producing animal products, many thoughtful people in the west are becoming concerned about the ethics of these methods. In Europe, mad cow disease shocked many people, not only because it shattered beef’s image as a safe and healthy food, but also because they learned that the disease was caused by feeding cattle the brains and nerve tissue of sheep. People who naively believed that cows ate grass discovered that beef cattle in feed lots may be fed anything from corn to fish meal, chicken litter (complete with chicken droppings), and slaughterhouse waste. The consumption of veal has fallen sharply since it became widely known that to produce so-called “white” – actually pale pink – veal, newborn calves are separated from their mothers, deliberately made anemic, denied roughage, and kept in stalls so narrow that they cannot walk or turn around. In Europe, this method of raising veal calves will become illegal on January 1st, 2007. Concern about how we treat farm animals has led millions of people in the west to become vegetarians, or even vegans – eating no animal products at all. Despite the existence of strong ethical, environmental and health arguments for vegetarianism, it is not yet a mainstream position. More common is the view that we are justified in eating meat, as long as the animals have a decent life before they are killed. The problem is that industrial agriculture denies animals even a minimally decent life. Tens of billions of chickens produced today never go outdoors. They are bred to have voracious appetites and gain weight as fast as possible, then reared in sheds that can hold more than 20,000 birds. The level of ammonia from their accumulated droppings makes the air so acidic that if you enter the shed, it stings your eyes and hurts your lungs. The effect on the birds, who live in that atmosphere for their entire lives, is much worse. Slaughtered at only 45 days old, their immature bones can hardly bear the weight of their bodies. Some collapse and, unable to reach food or water, soon die, their fate irrelevant to the economics of the enterprise as a whole. Conditions are, if anything, even worse for laying hens crammed into wire cages so small that even if there were just one per cage, she would be unable to stretch her wings. But there are usually at least four hens per cage, and often more. Under such crowded conditions, the more dominant, aggressive birds are likely to peck to death the weaker hens in the cage. To prevent this, producers sear off all birds’ beaks with a hot blade. A hen’s beak is full of nerve tissue – it is, after all, her principal means of relating to her environment – but no anesthetic or analgesic is used to relieve the pain. Pigs may be the most intelligent and sensitive of the animals that we commonly eat. When foraging in a rural village, they can exercise that intelligence and explore their varied environment. Before they give birth, sows use straw or leaves and twigs to build a comfortable and safe nest in which to nurse their litter. But in today’s factory farms, pregnant sows are kept in crates so narrow that they cannot turn around, or even walk more than a step forward or backward. They lie on bare concrete without straw or any other form of bedding. The piglets are taken from the sow as soon as possible, so that she can be made pregnant again, but they never leave the shed until they are taken to slaughter. China does not have a well-developed tradition of concern for animal welfare or animal rights, as many western nations do. But to the extent that Buddhism has left its mark on Chinese culture and thought, compassion for all sentient beings cannot be considered a foreign import. It is, rather, one of the more noble elements of Chinese ethics that is in need of revival and strengthening. We should not ignore the sufferings of nonhuman animals merely because they are not members of our species. Some who have observed factory farming in China report that standards are low. Joyce D’Silva, of the British organization Compassion in World Farming, told me of seeing a totally unsuitable, western financed, intensive dairy farm that, in addition to being an inefficient form of food production and having poor animal welfare, was causing severe local pollution. China’s turn towards meat will not only be bad for the environment and bad for animals. It will also be bad for the health of its people. The world’s largest and most comprehensive study of diet and disease was based on research carried out in China in the 1980s, showed that in rural China, good health and normal growth are achieved on a diet that includes only one-tenth as much animal-based food as Americans eat (T. Colin Campbell and Thomas Campbell, The China Study : The Most Comprehensive Study of Nutrition Ever Conducted and the Startling Implications for Diet, Weight Loss and Long-Term Health, Benbella, Dallas, TX, 2005). Increases in the consumption of animal products above that very low base are correlated with an increase in the “diseases of affluence”: heart disease, obesity, diabetes and cancer. 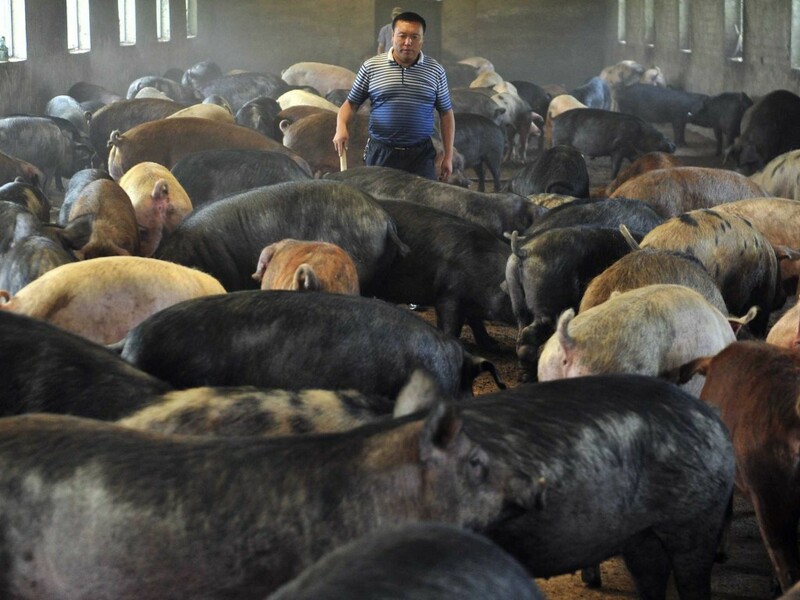 China still has hundreds of millions of small peasant farmers, raising animals by traditional, sustainable methods. Instead of establishing giant animal factories that will drive these small farmers out of business, small farmers should be encouraged to reform and improve their methods. In the west, the fastest growing section of the food market now is organically produced food, grown in a sustainable manner, without the use of synthetic fertilizers or pesticides. Animals kept on organic farms must have access to the outdoors. Millions of Chinese peasant farmers could, with some guidance, meet international organic standards and produce better quality products at lower cost to the environment. Since the demand in the west for organic food continues to grow, Chinese organic producers may also be able to find a profitable export market. It is tragic that countries like China and India, as they become more prosperous, are copying western methods and putting animals in huge industrial farms to supply more meat and eggs for their growing middle classes. If this continues, the result will be animal suffering on an even greater scale than now exists in the west, as well as more environmental damage and a rise in heart disease and cancers of the digestive system. It will also be grossly inefficient. Chinese consumers should not buy such products. They should refuse to support farming methods that are cruel to animals and bad for them. The author: Peter Singer is Professor of Bioethics at Princeton University and the author, with Jim Mason, of The Way We Eat: Why Our Food Choices Matter. (Rodale, New York, 2006).